Richard uses "domino-block" model to illustrate a common mode of upper crustal extension in the Rio Grande rift near Socorro. Real crustal blocks are not this rigid at depth. Since “retirement” in June 2010, Richard has continued to work part time at the Bureau on geologic map projects and related studies that concern Cenozoic volcanism, magmatism and the Rio Grande rift in central New Mexico. Richard’s primary interest is the structural control magmatism, geometry of magma ascent and the evolution of volcanoes, including the 32.5 million-year old supervolcano at Socorro known as the Socorro caldera. 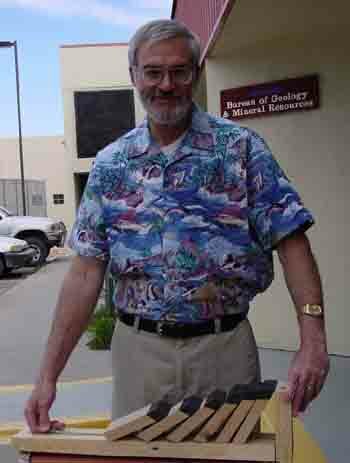 Exploration Geologist, NORANDA EXPLORATION INC.
New Mexico Geological Society: (elected honorary member, 1997) President, Vice President, Treasurer, Secretary, Guidebook Editor, Field Conference Chair, Publications Committee Chair, Spring Meeting Chair. 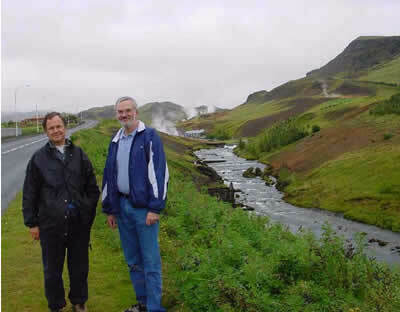 Richard (on right) and Carlo Doglioni, Universita' La Sapienza, Italy, tour the Hveragerdi geothermal field in southeastern Iceland. Chamberlin, R.M., McIntosh W.C., and Eggleston T.L., 2004, 40Ar/ 39Ar Geochronology and Eruptive History of the Eastern Sector of the Oligocene Socorro Caldera, Central Rio Grande Rift, New Mexico: in Tectonics, Geochronology and Volcanism in the Southern Rocky Mountains and Rio Grande Rift, S.M. Cather, W.C. McIntosh and S.A. Kelly (eds. ), New Mexico Bureau of Mines and Mineral Resources Bulletin. Leuth, V.W., Chamberlin, R.M., and Peters, L., 2004, Age of Mineralization in the Luis Lopez Manganese District, Socorro County, New Mexico: as Determined by 40 Ar/39Ar Dating of Cryptomelane, in press, in Tectonics, Geochronology and Volcanism in the Southern Rocky Mountains and Rio Grande Rift, S.M. Cather, W.C. McIntosh and S.A. Kelly (eds. ), New Mexico Bureau of Mines and Mineral Resources Bulletin. Chamberlin, R.M., 2004, Preliminary Geologic Map of the San Lorenzo Spring 7.5 Minute Quadrangle, Socorro County, New Mexico, New Mexico Bureau of Geology and Mineral Resources Open-file Geologic Map Series, OF-GM-86, 31p. 1 plate. Chamberlin, R.M., Eggleston, T.L., and McIntosh, W.C., 2002, Geology of the Luis Lopez Quadrangle, Socorro County, New Mexico: New Mexico Bureau of Geology and Mineral Resource Open File Geologic Map, OF-GM-53, 43p. 1 fig. 3 tables, 2 sheets. Chamberlin, R.M., 2001, Waning-stage Eruptions of the Oligocene Socorro Caldera, Central New Mexico: in Volcanology in New Mexico, L.S. Crumpler and S.G. Lucas (eds. ), New Mexico Museum of Natural History and Science Bulletin 18, p. 69-77. Chamberlin, R.M., Cather, S.M., Nyman, M.W., and McLemore, V.T., 2001, Preliminary Geologic Map of the Lemitar 7.5' Quadrangle, Socorro County, New Mexico: New Mexico Bureau of Geology and Mineral Resources Open-file Geologic Map OF-GM-38, 28 p. 2 plates. Chamberlin, R.M., 2001, Modal Mineralogy, Textural Data and Geochemical Data for Caldera-facies Hells Mesa Tuff and a Comagmatic Lava Dome, with Selected Data Plots and Supporting Map Data: New Mexico Bureau of Geology and Mineral Resources Open-file Report 458, 41 p.